I had the pleasure of meeting Lindsay Ely back in January for a book event at Quail Ridge Books. The evening was wet and snowy, but I knew I had to trek out for it! I also had the fortune to get to eat dinner with Lindsay before the event as part of Quail Ridge's Supper Club series. Clearly the audience was excited! I'm the one in front with the pink and purple hair! The event with Lindsay was an absolute delight. I hope I have the chance to meet her again, and I absolutely can't wait to see what she writes next! Here's a picture of Lindsay speaking at the event! Before the giveaway, let me give you a little information about Gunslinger Girl and Lindsay Ely. 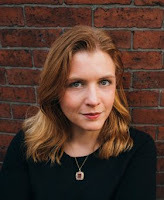 Lyndsay Ely (pronounced “eel-y”, as in those eels are looking very eel-y today) is a writer who currently calls Boston home. She is a geek, a foodie, a feminist, and has never met an antique shop she didn’t like. Her favorite color is crimson, and her favorite book is The Count of Monte Cristo. Gunslinger Girl is her debut novel. I am giving away TWO (2) prizes! 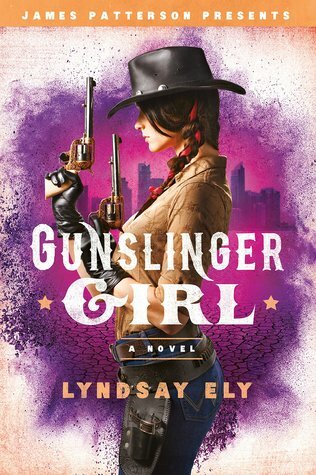 One winner will get a signed ARC of Gunslinger Girl by Lindsay Ely! A second winner will receive an assorted swag pack! Sadly, the giveaway needs to be US only due to shipping costs. Hopefully I will have options for International folks soon. If I combined two genres, I'd combine romantic comedy and sci-fi.